The Month of May has been set aside for many years as a month for Mary. This Christian custom of dedicating the month of May to the Blessed Virgin arose at the end of the 13th century. In this way, the Church was able to Christianize the secular feasts which were wont to take place at that time. In the 16th century, books appeared and fostered this devotion. The practice became especially popular among the members of the Jesuit Order — by 1700 it took hold among their students at the Roman College and a bit later it was publicly practiced in the Gesu Church in Rome. From there it spread to the whole Church. The practice was granted a partial indulgence by Pius VII in 1815 and a plenary indulgence by Pius IX in 1859. I had someone this month tell me that her husband had died. She missed him so much there were times that she grieved so much that she did not want to get out bed. She had no will to continue in life. It was hard for her to understand why God would take her husband. I know that my mom got to the point where she did not even care about eating. She would get a can of food out of the cupboard and open it up and eat from the can. she had no energy or will to heat it up and take the time to have a regular meal. So I prayed about the Lady's situation, taking time to think about how I should answer her. In the end I came up with a few points that I thought might be helpful. Take one day, one hour, one minute etc, at a time. Do not look at the big picture. Times like these can be over whelming. Give all your feelings to the Lord in prayer. Tell Him exactly how you feel. Are you angry? Tell him the truth. Tell Him why. Be honest. He already knows how you feel. At some point if you mean it, tell Him you don't want to feel this way but you can not change your heart. Beg for His grace to change your hearts feeling Himself. Pray to Mary, pray the Rosary she was a widow as well. She lost her spouse. she understands how you feel. Ask her to intercede for you. Find others that are widows. Get together for prayer etc. once a week. Not to have pity parties, but to encourage each other. Maybe shopping or visiting those in the retirement home who are lonely as well. Read the scripture below meditate on them, apply them to your situation. I Timothy 5:5, Psalms 68:5, Psalms 147:3, Psalms 146:9, Jeremiah 49:11, I am sure there are many other scripture references that can be found. Go faithfully to Mass and make a good confession opening up your heart completely to the Lord. In conclusion I want to say. Its hard to give advice without being there and seeing the situation. find a Priest or a Nun or even another Godly widow who you can confide in where you are at. Good advice? I hope so. I think most of what I said could be useful in many situations. Once I gave this advice there was one particular advice that I gave that stayed with me all week. it was this, "Pray to Mary, pray the Rosary she was a widow as well. She lost her spouse. She understands how you feel. Ask her to intercede for you." What Adam is to Jesus (I Cor. 15:45-49), Eve is to Mary. Many of the Early Fathers would have told you the same thing. St. Justin, the Martyr, in his work, Dialogue with Trypho, states that, "Christ became a man by a virgin to overcome the disobedience caused by the serpent ...in the same way it had originated." St. Ambrose of Milan writes, "It was through a man and woman that flesh was cast from paradise; it was through a virgin that flesh was linked to God." St. Jerome stated, "Death through Eve, Life through Mary." (Epist. 22,2 I ). St. Peter Chrysologus in his writings said, "Christ was born of a woman so that just as death came through a woman, so through Mary, life might return." The same goes for Mary. She was the Last Eve. She was conceived with out sin. And she lived a life of sinless perfection. Although Mary, the last Eve was conceived with out sin, and there also was no stain of sin in her life, (just as Jesus the Last Adam), she was ...."tempted in all things like as we are, without sin." What I am trying to say is that there is nothing we have not gone through that she has not felt in her life time. Look at the Litany of the Blessed Virgin Mary [The Litany of Loreto]. In it you will find that she is named , among many other names as a Virgin, a Person who was chaste and pure, holy, a Queen, Tower of David, Tower of Ivory, House of Gold, Ark of the Covenant, Gate of Heaven, and Morning Star. And yet she was not one who could not have compassion on our infirmities: she was tempted in all things like as we are, but without sin. Because of this she is also named in the litany as, Health of the Sick, Refuge of Sinners, Comforter of the Afflicted, Help of Christians. We can go to her and ask for her intercession in prayer to her Son. 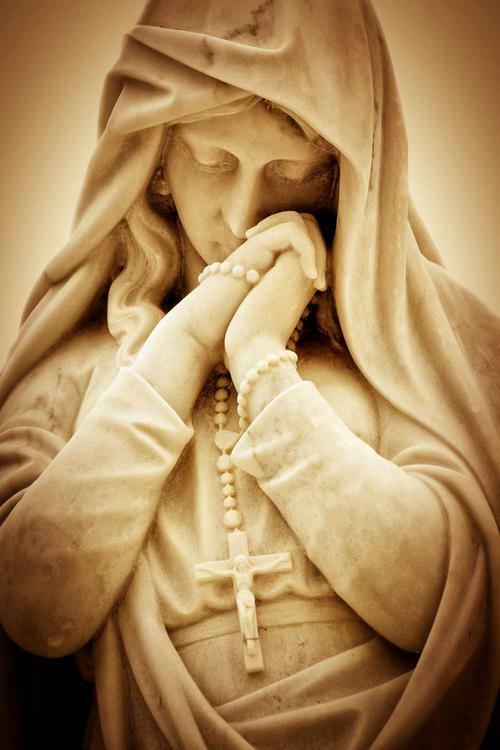 Saying, "Pray for us, O Holy Mother of God." As our Mother she desires to protect us as a mother hen protects her children. Her love is there even when we do not see it. In the book finding Your Way, Gary LaFerla tells an amazing story, which comes from the records of the United States Naval Institute following the Second World War. The USS Astoria engaged the Japanese during the battle for Savo Island before any other ships from the U.S. naval fleet arrived. During the crucial night of the battle, August 8, the Astoria scored several direct hits on a Japanese vessel but was itself badly damaged and sank the next day. About 0200 hours a young Midwesterner, Signalman 3rd Class Elgin Staples, was swept overboard by the blast when the Astoria's number one eight-inch gun turret exploded. Wounded in both legs by shrapnel and semi-shock, he kept afloat by a narrow life belt that he managed to activate with a simple trigger mechanism. At around 0600 hours Stapes was rescued by a passing destroyer and returned to the Astoria, whose captain was attempting to save the cruiser by beaching her. The effort failed, and Staples, still wearing the same lifebelt, found himself back in the water. It was lunchtime. Picked up again, this time by the USS President Jackson (AP-37), he was one of 500 survivors of the battle who were evacuated to Noumea. On board the transport, Staples hugging that lifebelt with gratitude, looked at the small piece of equipment for the first time. He scrutinized every stitch of the lifebelt that served him so well. It had been manufactured by Firestone Tire and Rubber Company of Akron Ohio, and bore a registration number. Given home leave, Staples told his story and asked his mother, who worked for Firestone, about the purpose of the number on the belt. She replied that the company insisted on personal responsibility for the war effort, and that the number was unique and assigned to only one inspector. Staples remembered everything about the lifebelt, and quoted the number. There was a moment of stunned silence in the room and then his mother spoke: "That was my personal code that I affixed to every item I was responsible for approving." This story reminds us that the one who gave birth to us by giving birth to Jesus, is there to protect us, to love us, to pray for us and to intercede for us. Thank you Mother for all you did and have done and will do for us. And Jesus.....thanks for giving her to us. So on this last Sunday of May we just want to say, "We Love You Mom!"